Calculates a 2D array of function values defined on a grid. Numbers of values for both variables used in the function calculation. Function definition of exactly two different variables. The formula can contain any number of valid variables. Start values of the variables in the interval where this node starts calculating values. This input can contain only two elements. Otherwise, this node returns an error. End values of the variables in the interval where this node stops calculating values. 1D array of the used x1 arguments. 1D array of the used x2 arguments. 2D array of the calculated function values. 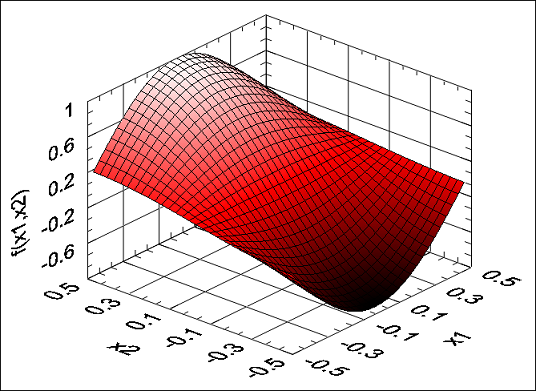 The illustration below shows the visualization of the following function in the interval (-2, 2) * (-2, 2).